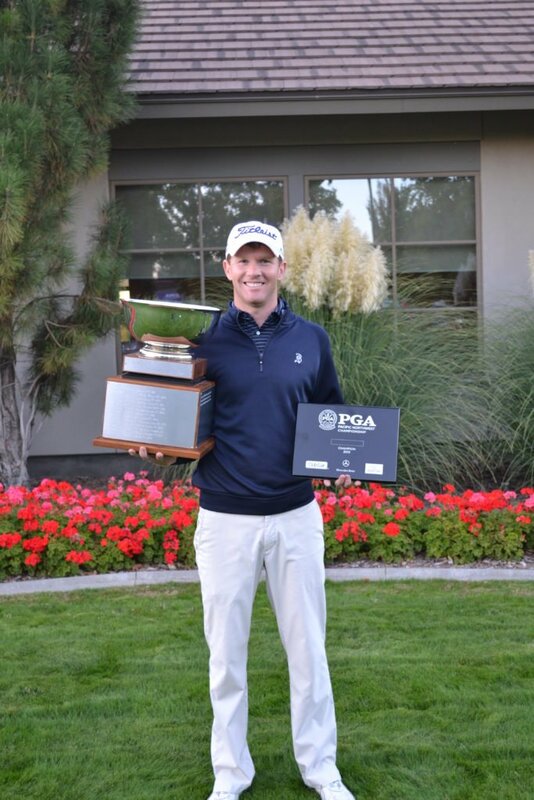 Tim Feenstra of Broadmoor GC (Seattle, WA) won the Pacific Northwest PGA Professional Championship by one stroke over Tony Robydek of Pro Golf – Tacoma (Tacoma, WA). Feenstra previously won this event in 2011 at Illahe Hills CC. 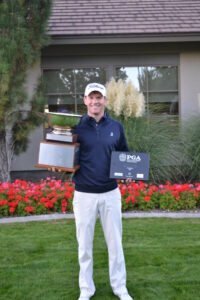 The Pacific Northwest PGA Professional Championship in addition to crowning the Section Champion also serves to qualify 8 professionals for the National PGA Club Professional Championship next June in Myrtle Beach, SC. Corey Prugh of Manito G&CC is already exempt for next June’s event due to his T-18th this past summer. The eight players advancing in addition to Feenstra and Robydek were Jeff Coston of Semiahmoo G&CC (Blaine, WA), Ryan Malby of Iron Horse GC (White Fish, MT), Jason Aichele of Meadow Springs CC (Kennewick, WA), Tyler Sweet of Sunland G&CC (Sequim, WA), Ryan Benzel of Pro Golf – Lynnwood (Lynnwood, WA) and Scott Krieger of Broadmoor GC (Portland, OR). In 2014, the National Championship field will compete at The Dunes Golf & Beach Club and Grande Dunes Resort Club in Myrtle Beach, part of the more than 100 courses on the famed 60-mile “Grand Strand” in the Palmetto State. The Dunes Golf & Beach Club will serve as the primary course in the National Championship, including the final 36 holes. It has been designated one of the nation’s “Top 100 Courses” by GOLF Magazine, Golf Digest, and Golfweek. Designed by legendary Robert Trent Jones Sr., the par-72 Dunes Golf & Beach Club extends to 7,195 yards and is the only layout in Myrtle Beach with ocean views. Grande Dunes Resort Club, designed by the Robert Rulewich Group and opened in 2001, lies in the heart of Myrtle Beach, and the par-72 layout can be extended to 7,600 yards. It was selected the 2009 National Golf Course of the Year by the National Golf Course Owners Association. The PGA Professional National Championship, carrying a $550,000 total purse this year, is broadcast (all four rounds) by GOLF CHANNEL. Following 36 holes of play, the field will be trimmed to the low 70 scorers and ties. The low 20 scorers in 2014 will earn berths into the 96th PGA Championship, Aug. 7-10, 2014, at Valhalla Golf Club in Louisville, Ky. Established in 1968, The PGA Professional National Championship roster of Champions includes past and present Tour professionals: Sam Snead, Bob Rosburg, Don Massengale, Ed Dougherty, Larry Gilbert, and Bruce Fleisher. The PGA Professional National Championship is presented by Club Car, Mercedes-Benz, and OMEGA. Supporting sponsors are Titleist/FootJoy, Nike Golf, TaylorMade-adidas and Ashworth Golf, and the PGA TOUR. GOLF CHANNEL is the official media partner. The 41 Section Championships and the National Championship offer a combined purse of $1.5 million. Meadow Springs Country Club offers one of the premier golf courses in Washington State. The club was incorporated in July 1973. Its 18-hole private golf course was designed by Robert Muir Graves and is one of Washington State’s top rated courses. Tony Robydek of Pro Golf – Tacoma (Tacoma, WA) holds a slim one-shot lead over Tim Feenstra of Broadmoor GC (Seattle, WA) and Scott Krieger of Broadmoor GC (Portland, OR). Both Robydek and Feenstra both fired a four-under 68’s for their second round. Corey Prugh of Manito G&CC (Spokane, WA) is two back of Robydek while last year’s champion Ryan Benzel of Pro Golf – Lynnwood (Lynnwood, WA) is three strokes back. Scott Krieger of Broadmoor GC (Portland, OR) holds a slim one-shot lead over Ryan Benzel of ProGolf – Lynnwood (Lynnwood, WA) and Mark Keating of Meriwether National (Hillsboro,OR). Krieger was the only player able to break par in the 30 mph winds at Meadow Springs Country Club. Krieger’s round included five birdies. CLICK HERE to view past champions of the PGA Professional Championship.